These Rosters were created March 22, 2019 and will be updated regularly. If, after referring to the appropriate roster, you do not find the licensee you are researching please email Yolanda@dentalboard.org for license verification. Rosters of currently active, licensed Dentists, Dental Hygienists, and holders of Alabama Controlled Substances Permits are updated regularly. Please click on the links to access these rosters. If you wish to request the public file(s) associated with a licensee, please email your request to Yolanda@dentalboard.org. Verifications are NOT available by telephone. If you wish to verify the status of a license or permit which does not appear on the current roster, please email your inquiry to Yolanda@dentalboard.org. This verification of licensure is a public service provided by the Board of Dental Examiners of Alabama to assist the consumer in obtaining information about dentists and dental hygienists licensed in Alabama. 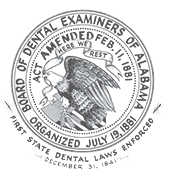 The Board of Dental Examiners of Alabama makes no representations or warranties, express or implied, as to any posted information, and assumes no responsibility for any errors or omissions. This listing is not intended to serve as a practitioner referral or locator service as the Board cannot recommend or endorse licensees. No warranty, express or implied, is created by providing information, nor does the information herein regarding a licensee or permittee constitute an endorsement by the Board of Dental Examiners of Alabama. If you have any questions regarding the posted information, please contact the Board of Dental Examiners of Alabama at (205) 985-7267.